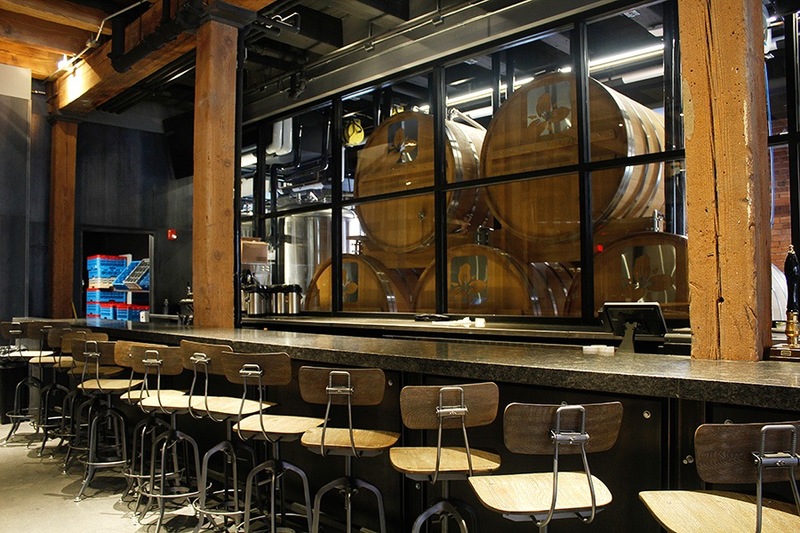 Trillium Brewing Company finally has a place in Boston where beer lovers can sip signature hoppy ales, stouts, sours, and lagers all day, every day—not a seasonal beer garden, not a temporary beer hall on the outskirts of town, but an easily accessible taproom in the middle of the city. 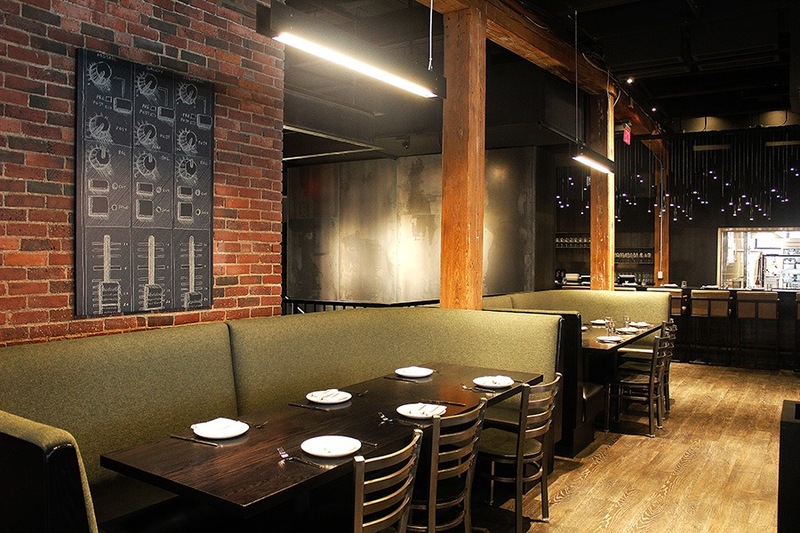 Softly open now (with a solid preview of its food menu) at 50 Thomson Place in the Seaport, the new 450-person-capacity Trillium Fort Point is also a full-service restaurant, brewery and barrel-aging facility, and Boston’s hottest new roof deck bar. The grand opening and full-menu launch is slated for Monday, Oct. 29. Find it past a public courtyard at the dead-end of Thomson Place, in a renovated, former Boston Wharf Co. building. Trillium cofounder JC Tetreault hopes a fenced-off seating area outside will at least get some use this fall before the cold really sets in. The main entrance leads into the taproom, with a retail counter straight back, a staircase up to the main dining room, and a 23-seat bar to the right. 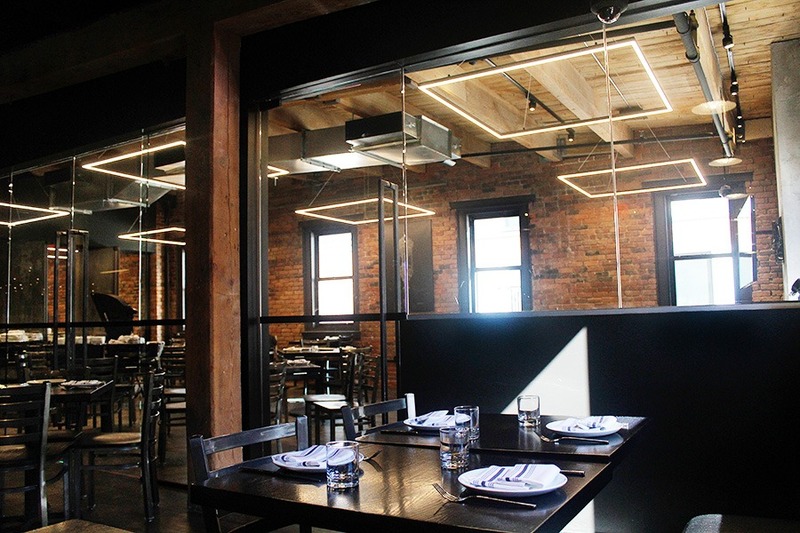 Restored, original posts, beams, and brickwork give the room a sense of place that jives with the feel of the original Trillium location, just a few blocks away on Congress Street. (That small brewery will continue to be used, but the cramped retail store there closes to the public now that Trillium is open on Thomson Place.) Whitlock Design Group led the charge. The retail counter now sits in front of a 1,200-square foot cold storage room, the floors of which Trillium’s engineers had to reinforce to hold the literal tons of beer that will chill in there. The cooler houses kegs for all 96 total draft lines throughout the restaurant (expect two dozen options to pour regularly), as well as all the packaged beer for to-go sales. 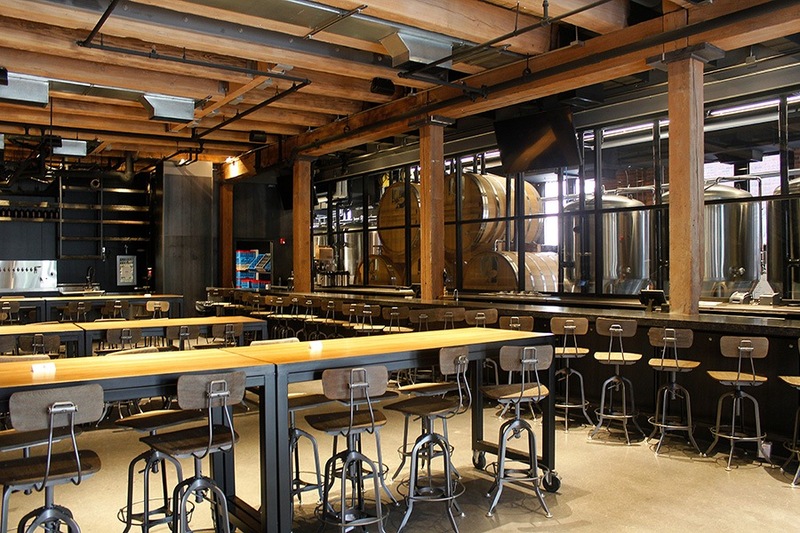 From the taproom bar, catch glimpses of production staff working in the 10-barrel brewhouse. Five Trillium-branded, oak foeders are stacked to cellar up to 200 barrels of beer. Adjustable shop chairs surround a bunch of high-top tables, which are on wheels and can nest together to open up the space for events and happenings. 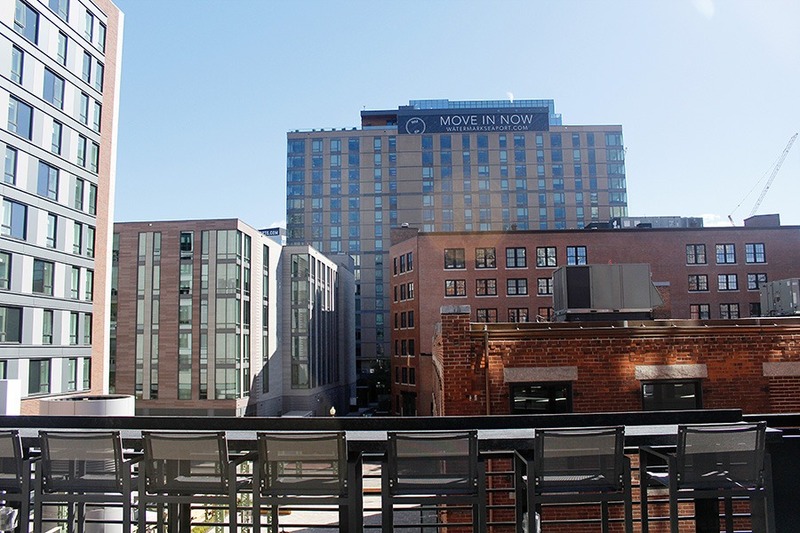 “The ability to morph, and change, and evolve the space when you need to, we thought long and hard about how to design this place to accommodate that,” Tetreault says. 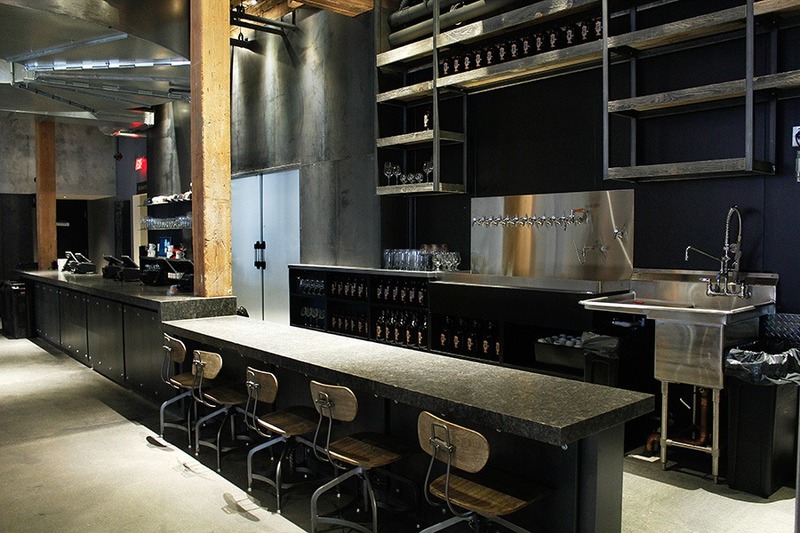 Modern Draught set up the elaborate, custom draft system for the state-of-the-art brewpub. 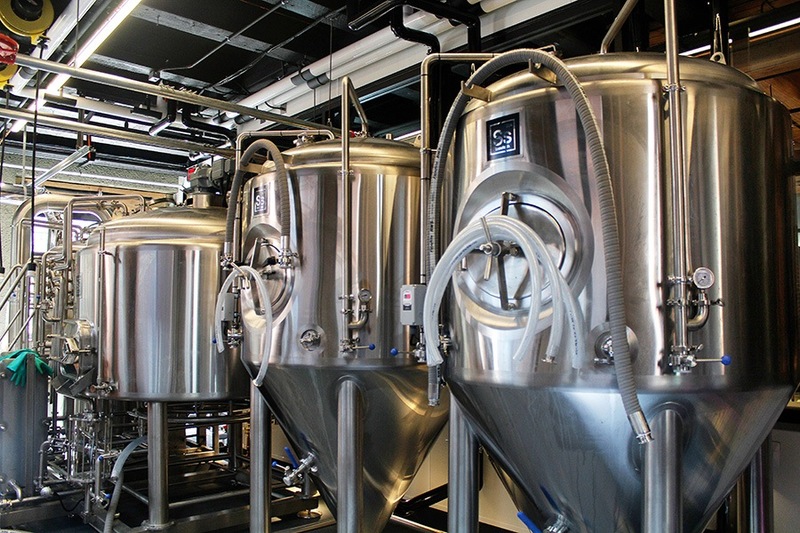 It’s coded to serve each and every beer at its optimal temperature, carbon dioxide levels, and speed, Tetreault explains. The bars will serve a variety of favorites and new brews created at all three Trillium facilities. A second, smaller, soapstone bar is at the top of the stairs. It has a large, glass window looking into the kitchen (and at the chickens, ducks, and house-made sausages that chef Michael Morway will soon have hanging up there). The farm-to-table menu is available to order throughout the space, though the custom-built, wood-fired grill casts maximum coziness around the second-floor dining room. 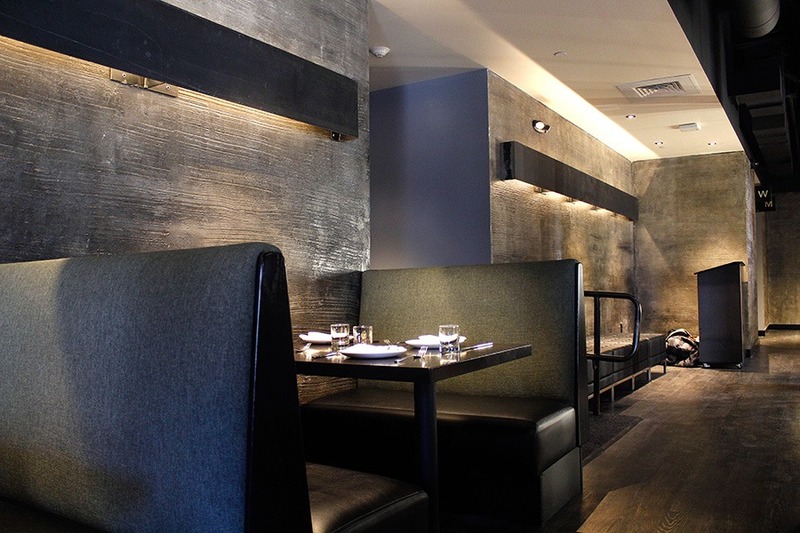 It’s well-appointed with leather barstools, booths, and green banquettes. 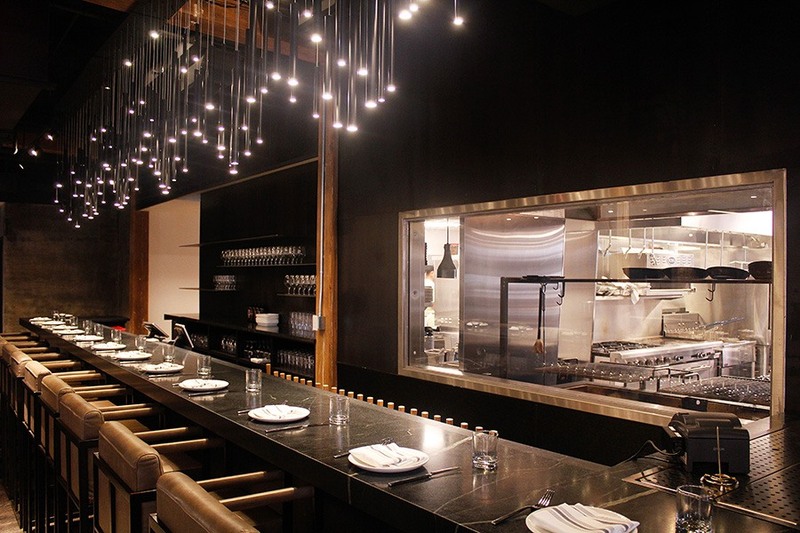 The dark room has warm, modern light fixtures, and industrial details like a chain curtain around a semi-private nook for small parties. Glass surrounds an 85-seat private dining room, which has a divider to section it off into two smaller spaces. 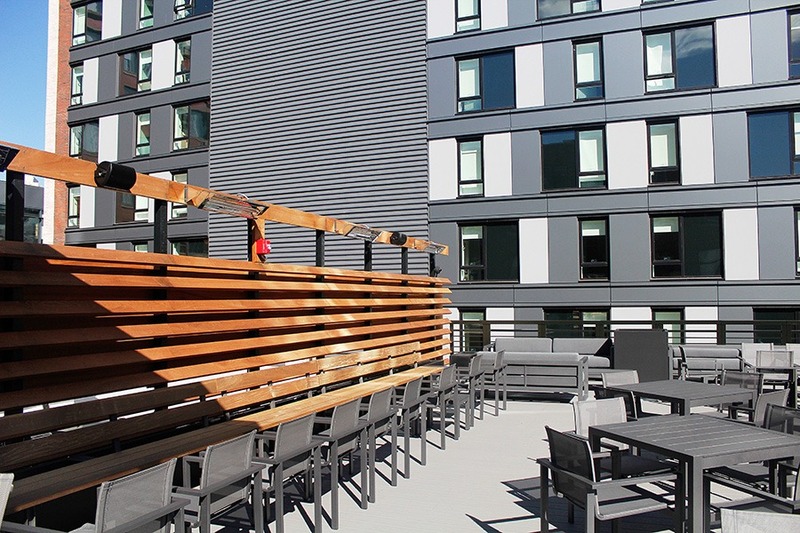 The third-floor rooftop has its own, black-tiled bar, covered in a roof charred in the style of Japanese shou sugi ban (pressure-treated wood). Seasonally changing plant boxes will provide some privacy between the tables, and there are also a few lounge areas with sleek, gray couches and lower tables. Seating along a drink rail overlooks the first-floor patio and the public courtyard. Standing on the roof deck last week as contractors put the final touches on the black, honeycomb-tile backbar, Tetreault reflected on how it is at once a long time coming for such an amenity in Boston, and how quickly Trillium has grown. Since he and his wife and business partner, Esther, founded Trillium five and a half years ago, “We always wanted to create hospitality and food and all kind of things, but it’s just whether or not you could realize those aspirations,” he says. Almost as soon as Trillium opened in 2013, the Tetreaults realized they would need a larger space to appease beer fans getting into the increasingly exciting craft beer scene. In 2016, Trillium expanded with a taproom in a Canton industrial park. The couple has also always dreamed of owning a farm to fuel their culinary vision, and earlier this year they purchased land in North Stonington, Conn., to make that a reality, too. But they always kept eyes on real estate in the Seaport area. “We didn’t want to leave our home,” Tetreault says. 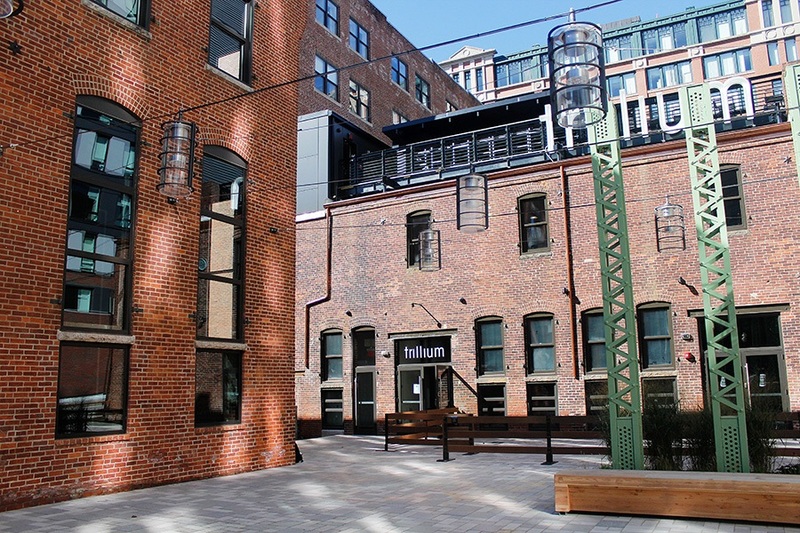 And now, Trillium is finally forever rooted in Fort Point. 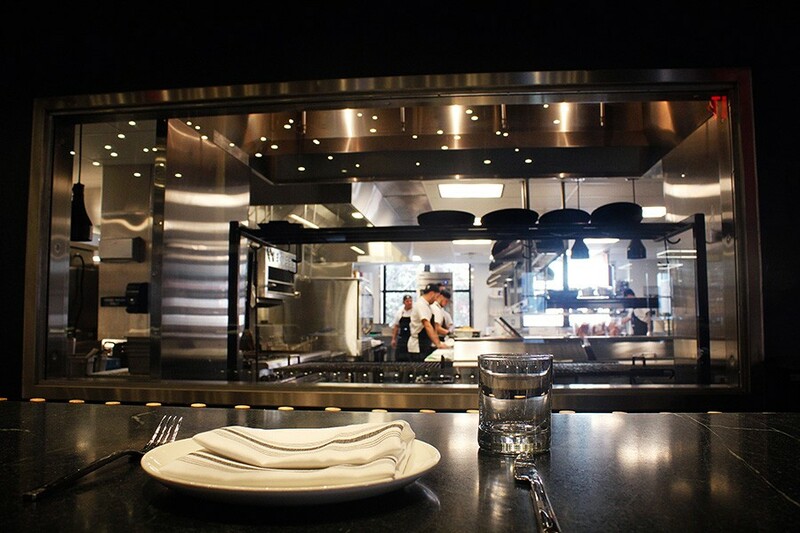 The Trillium restaurant softly opens today with a limited menu for the next week and a half. The grand opening and full menu launch is on Monday, Oct. 29. It’s open with beer, food, and retail sales every day from 11 a.m.-11 p.m.